Kerseys are legal problem solvers too! At Kerseys we do all these things. People think of solicitors and the legal transactions they carry out: conveyancing, making a will, setting up a trust, administrating an estate, buying and selling businesses, creating legal documents, getting a divorce. We believe, and our feedback tells us, we are good at them too. But we are also more than that; we are the legal problem solvers! 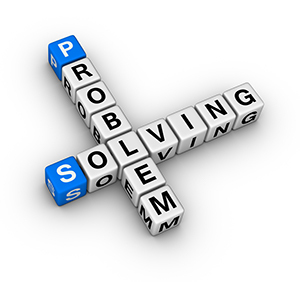 Sometimes, problems arise in the above legal areas (and many, many more) or there are disputes about them with others, be they family members, neighbours, institutions, insurance companies, work colleagues, business partners, contracting parties or just the ‘man in the street’. We have solicitors on our team who are highly experienced in giving advice and solving situations like this. We know the subjects, are used to legal research tasks in more specialist cases, or have wide professional networks to get to get even more specialist advice at good rates if your problem is really unusual. Our solicitors are used to going to court if necessary, and can explain to you in a clear ‘cost benefit’ way what the process of doing so involves. And because we are knowledgeable and respected in our craft, many of our clients avoid having to spend lots of going all the way to trial to get a fair outcome. In 90% of cases, assuming your case is good, we get a result by persuasion or negotiation, or mediation. Of course, very often a court case has to be threatened: otherwise who will believe you are serious! Sometimes it needs to be started if the threat does not work. So whether it be a claim, or a copyright issue, or a contractual conundrum, or you just want to know ‘can you tell me where I stand’, we can help. We also understand that because these types of problems sometimes seem intractable, or at least open-ended, people are concerned about how much it might cost too. So how does it work at Kerseys? Click here to see our Business Disputes page for an example of how we work and our costs.